The roof is the essential component of any building. It adds completion to beautiful home design as well as offers complete protection from the outside elements. Over time, your roof may show signs of wear and tear. If you address the problem early on, you’ll minimize the repair and keep the maintenance costs low. How do you know if you have a worn out roof? Intelligent Design offers complete roofing inspection. We can assess your roof and identify any issues that may arise. Below are the five main points we evaluate. We keep an eye out for signs of moisture damage throughout your home or office building. Damp spots may appear on the ceiling. We may notice water spots forming on walls from moisture that is seeping in. Small holes in the roof contribute to the build-up of attic and wall moisture. This can cause significant damage to the building’s structure, as well as mold build-up. If you see the light coming in through the attic or the roof, the decking may be cracking or pulling apart. We can walk through the attic to spot any openings in the roof. Where there are openings, there are sure to be air and water leaks. If you notice the paint on your building is looking excessively cracked or peeling in no small degree, it’s time for a roof inspection. This is a sign of roof failure that can appear on either interior or exterior paint, especially around the roof line. Damaged paint can also be evidence of a buildup of moisture as a result of poor attic ventilation. Asphalt shingles usually come with a 15-20 year warranty. After that, a roofing company will need to perform an inspection of the roof. One of the most common issues we look for are cracked or curling shingles. The shingles could be damaged by weather, or they could just be getting old. Dry shingles that are brittle enough to break upon touching are also a hidden sign of roof failure and indicate your shingles need to be replaced soon. If you notice water is dripping down the sides of the gutters, it’s a clear sign we need to replace or clean out the gutters. We can get on top of the roof to assess the overall condition of the gutter system. If the gutters need to be replaced, we recommend investing in seamless gutters with gutter guards. Guards will keep your gutters from overflowing. If you are looking for professional roofing installation, repair, or complete replacement, contact Intelligent Design. 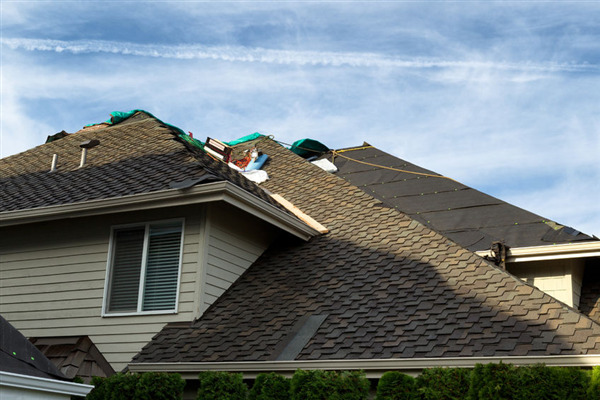 We offer a wide range of roofing services for both home and business owners in Maple Grove, Minnesota and the surrounding Twin Cities metro area. To schedule service or get an estimate, call us at 763-315-0745.